If the Penguins are going to repeat as Stanley Cup Champions, it's going to be without the player who factored in on all four game winning goals in the Stanley Cup Finals last season. After weeks of speculation as to the extent of his injury, the Pens revealed today that Kris Letang has been suffering from a herniated disk in his neck, and that attempts to rehabilitate the injury to have him ready for the playoffs were unsuccessful. 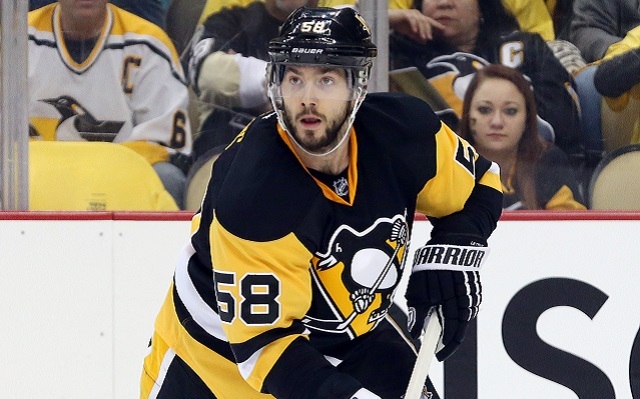 Letang will undergo season-ending surgery that leaves him with a 4-to-6 month timetable to return. The injury comes as a big blow to the Pittsburgh defense, which desperately could use reinforcements with Trevor Daley and Olli Maatta also currently out with injuries. It'll be impossible for the Pens to replace the production that Letang brings to the ice. Both Daley and Maatta have resumed skating, and their ability to get back into the lineup would provide a big boost to a blue line that has been relying on Wilkes-Barre/Scranton callups for a good chunk of the backstretch of the season. The Penguins are currently positioned to open their Stanley Cup defense at home against the Columbus Blue Jackets.